For nearly three months during the spring of 2010, hundreds of millions of gallons of BP oil flowed into the Gulf of Mexico, horrifying Americans who watched live as the worst marine oil spill in history unfolded. The daily images and video of slick guck spreading along the shoreline of the southeastern United States, coupled with stories from the oil rig explosion that left 11 men dead, generated nationwide calls for criminal charges against the company and its executives. Two years later, the bill came in: a record-breaking $4.5 billion criminal settlement negotiated between the Department of Justice (DOJ) and BP, plus criminal charges for four company officials. The case was unique for more than just its size. Although the federal government extolled the win as the start of a new era of environmental policing, an analysis by The Crime Report of thousands of records compiled by the Environmental Protection Agency (EPA), reveals that enforcement of corporate environmental crime remains extremely rare. For the first time, ordinary citizens will be able to track how the government is monitoring compliance with federal environmental regulations, through a unique searchable database compiled by TCR, with support from the Fund for Investigative Journalism. The database allows citizens to find out which companies have violated environmental laws in their communities; how much—if anything—they’ve been fined; and how long those companies have been operating in violation. (Embedded below is a condensed version of the database. For the more detailed, geocoded version, visit our special EPA Violators page, where data will be updated regularly, by clicking HERE (http://www.thecrimereport.org/epa-violators). The eight-month-long database project underlines the anomalies of a system that has allowed the vast majority of corporate environmental lawbreakers to escape prosecution. On paper, the government has impressive tools to apply criminal penalties to serial environmental law violators. The wording of the Clean Air Act, Clean Water Act and the Resource Conservation and Recovery Act is unique in federal enforcement because “if you get caught, you can get charged anywhere along the line,” says Mark Roberts, an attorney and international policy advisor with the Environmental Investigation Agency (EIA), a non-profit advocacy group based in Washington, D.C. and London. Every violation can technically be treated as a crime, but federal environmental law gives agencies discretion to pursue civil or administrative charges instead. Environmental law experts, former EPA investigators and advocates interviewed by The Crime Report said this means most corporate violators can avoid criminal prosecution. As a result, the vast majority of corporate environmental transgressions — even cases that involve the releases of large amounts of toxic chemicals — are relegated to civil and administrative enforcement. 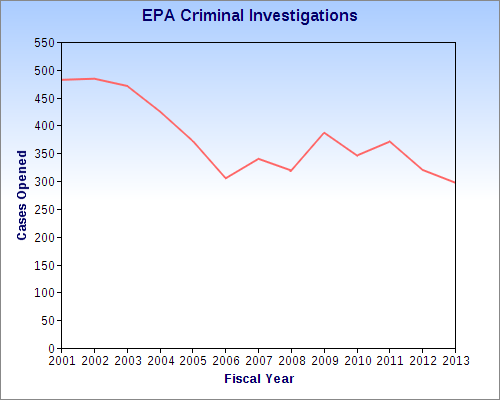 In fiscal year 2013, the EPA’s Criminal Enforcement Division launched 297 investigations. In 2012, 320 investigations were opened; the total has steadily decreased since 2001. In response to questions emailed to the EPA, Jennifer Colaizzi, an agency spokesperson, said the decline in cases is due to a decision to focus on “high impact cases,” as well as financial strains. “The reality of budget cuts and staffing reductions make hard choices necessary across the board,” Colaizzi said. With just 38 prosecutors manning the DOJ’s Environmental Crimes Section and 200 agents in the EPA’s Criminal Enforcement Division, monitoring cases across the country, the federal government has limited capacity to pursue many of America’s worst environmental offenders. Perhaps nowhere is this more evident than in Appalachia, where a seemingly endless parade of civil settlements and consent decrees has done little to abate a history of environmental malfeasance. Between 2000 and 2006, Massey Energy Company — then the country’s fourth-largest coal producer — violated water pollution limits more than 4,500 times. Day after day, for at least six years, Massey discharged acid drainage, coal slurry and hazardous sediments — often at more than 10 times the legal limit — into local waterways throughout West Virginia and Kentucky. Unlike the BP case and other high-profile prosecutions, the effects were mostly invisible, beyond fish with clogged gills. Still, it was a slow-developing environmental catastrophe, which court documents suggest resulted from the nearly constant flouting of federal law. In 2008, the EPA and Massey agreed to a $20 million settlement in the case, at the time the largest in the history of the coal mining industry. But West Virginia activist Bo Webb says the DOJ should have pressed criminal charges against executives of the company, which at the time was worth $2.1 billion. The EPA lawsuit noted that if fines for the violations were added up individually, Massey could have been on the hook for more than $1 billion. Webb lives in Coal River Valley, where streams and rivers squiggle through a seemingly boundless supply of thickly forested hills and mountains. His home sits in the shadow of a mountaintop removal mine, where a type of coal removal is practiced that involves stripping the summit of a mountain bare and mining it top-down. Since the process came to Appalachia in the late 1970s, Webb said the region has struggled with an onslaught of toxic runoff. 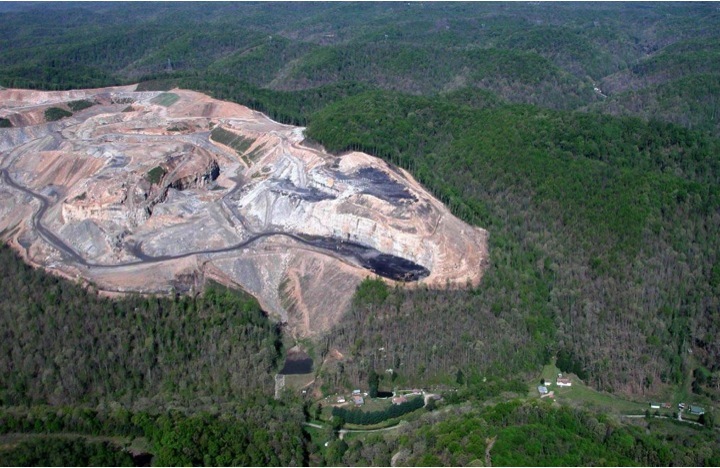 In August 2013, he testified before the U.S. Senate in support of the Appalachian Community Health Emergency Act, which would require the federal government to examine the health impacts of mountaintop removal coal mining. Webb and West Virginia University researcher Michael Hendryx co-authored a study of cancer among residents of the Coal River Valley that found the region suffers the disease at 50 percent higher rates than the general American population and has a 42 percent higher rate of birth defects. Webb’s first wife died of lung cancer in April, 2013. He blames the mine. “She didn’t smoke. I was off at work and she was home, outside in the garden, near that mine; breathing in that air,” Webb said. In West Virginia, the list of lives claimed by coal mine disasters is long. After a 2010 explosion at the Upper Big Branch Mine in Mont Coal, WV left 29 dead, Massey shareholders approved the sale of the company to Alpha Natural Resources, Inc., partly in the hope that the new — wealthier — company could help stave off a slew of labor and environmental criminal charges, according to news reports. Alpha “agreed to make payments and safety investments totaling $209 million in connection with the criminal investigation,” according to a DOJ announcement in December 2011. Charges were never filed, though the investigation is technically ongoing. But even with the intense scrutiny brought to Massey and Alpha by these cases, little changed at company mines. After Massey, Alpha and its subsidiaries racked up more than 6,000 violations between 2007 and 2013, for essentially the same issues Massey previously settled. The DOJ once again sued. In March, Alpha agreed to pay the federal government $27.5 million — another record settlement — as well as spend $200 million to reduce toxic discharges at dozens of mines and processing plants. Webb doubts this round of payments and promises will be any different than those before it. For Americans living in the company towns that are so often home to mines, refineries, processing plants and other major polluters, environmental concerns are often balanced against the interests of big companies that employ practically whole communities. On September 28, 2012, Billy Smith peered inside the fire-eye of a badly outdated, half-century-old industrial Wickes steam boiler at a refinery in Wynnewood, OK.
His colleague, Russell Mann, stood a few feet away and turned the gas valves, waiting for Billy’s signal that the rickety boiler’s fire had been lit. It exploded, killing both men. The EPA fined the refinery $86,000 and the federal Occupational Safety and Health Administration (OSHA) fined it $281,000. The EPA confirmed to The Crime Report that it did not conduct a criminal investigation into the incident. Smith and Mann’s wives say that’s not good enough. They sued in 2013, claiming the refinery’s current owner, CVR Energy Corporation, was negligent in not replacing or updating the boiler after purchasing the refinery in 2011 from Gary-Williams Energy Corporation. CVR declined a request for comment, citing pending civil litigation. Smith said folks in Wynnewood have long known of the plant’s danger, but no one wants to put the small town’s main employer at risk. Despite the explosion and deaths, her lawsuit is not popular, she said. “We got accused of trying to shut the place down,” she said. In an interview with The Crime Report, their attorney, Gary Riebschlager, accused the refinery of keeping the antique boiler around to skirt modern environmental laws. The boiler, he said, was last updated in 1979, exempting it from air quality regulations adopted in 1980. “The best option is to throw out your old equipment and join the 21st century, but if you do that, it’s not very likely your unit is going to comply with EPA inspections,” Riebschlager said. For CVR — a Fortune 500 company that was taken over by billionaire investor Carl Icahn after a 2012 hostile bid — and its subsidiary Coffeyville Resources Refining & Marketing, the explosion was just the latest black eye. In the last decade, CVR has settled a number of cases with the EPA. 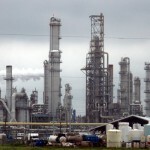 In 2012, it reached a $13 million settlement with the EPA stemming from incidents in 2004, when its Coffeyville, Kansas refinery failed to notify emergency response agencies that toxic gases had been released into the air. During a 2007 flood, the same refinery leaked thousands of barrels of crude oil and diesel fuel. The leaked material, carried by flood water, coated the town. The EPA settlement cost the company $2.3 million. And in 2013, the EPA scored another $300,000 air pollution settlement. Despite protests by environmental activists who want to see the criminalization of major polluters, it’s not easy to win convictions against large companies. David Wilma, a former EPA criminal investigator, said during an interview that corporate cases are simply harder and more time-consuming than those that take on individuals and small businesses. “The typical corporate case can take two to three and a half years. But if you have ‘Joe Schlock the barrel hauler,’ you catch him red-handed and you’re out in two months,” Wilma said. He said one of the major hurdles for investigators is getting the “human testimony” that proves the company, or someone within the company, was aware that laws were being broken. Before coming to the EPA, Wilma was an investigator with the Drug Enforcement Agency. He said he had an easier time getting witnesses to agree to testify against the bosses of the criminal underworld than he did getting corporate employees to implicate their bosses. On the other side of the courtroom, corporations are often willing to spend millions — more even, than they risk in fines — to prevent being labeled “criminal,” said Roberts, the EIA attorney. During the initial investigation, the response to an EPA request for information might be to return a tremendous amount of documents, Roberts said. Roberts added that another common tactic is to look for even the smallest error in the government’s collection of information and use that as the basis for a counterclaim, which can delay a case for years — often giving the company time to earn in interest more than it will be required to pay in fines or a settlement. Despite small armies of lawyers and delay tactics, every once in a while, a corporate environmental case actually goes to trial and ends in conviction. When a Texas jury in 2007 found the Citgo Petroleum Corporation guilty of violating the Clean Air Act, it was a first for a major oil company. 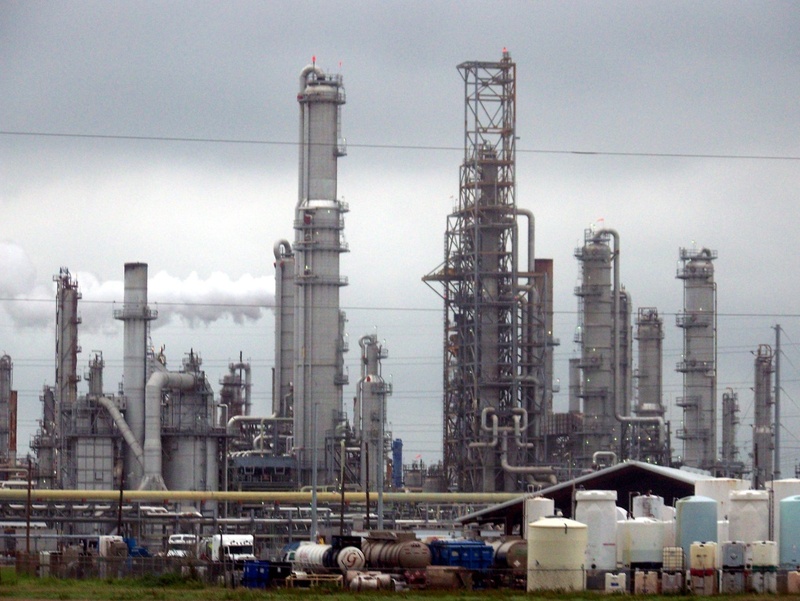 The company’s Corpus Christi, Texas refinery knowingly emitted Benzene, a carcinogen, into the air for nearly a decade, before getting caught in 2004. In court, residents of Hillcrest, a predominantly low-income, minority community bordering the refinery, described a decade of life experienced with noxious fumes that seemed to get absorbed into everything: clothes, food, skin, eyes. Real estate values plummeted and residents suffered mysterious illnesses, often for months at a time. More than 300 people submitted victim impact statements to U.S. District Judge John D. Rainey. In another first for an environmental case, 15 were classified as victims of a crime. The Citgo conviction and victim classification seemed like landmark wins when they were announced. Prosecutors argued that the refinery had generated more than $1 billion in profits while operating illegally. They asked the court to order Citgo to set up a fund to cover relocation costs for victims, and cover future medical expenses, including annual cancer screenings. They also requested $30 million in restitution for victims and $25 million for the government. In February of this year, two decades after Citgo first sent Benzene wafting through the air toward unsuspecting lungs, Rainey sentenced the company to pay the government $2 million. And in early May, he announced that victims were not entitled to any restitution, declaring there wasn’t enough evidence to prove that the sicknesses suffered by Hillcrest residents were directly tied to Citgo. “He basically said you are not a victim of environmental crime unless you can definitively show that you are harmed through exposure,” said Melissa Jarrell, an associate professor of criminal justice at Texas A&M University in Corpus Christi. Jarrell has been working with Hillcrest residents on the case for eight years, and plans to file an amicus brief in support of their appeal. It’s particularly hard when you’re working with scores of victims more than a decade removed from their exposure to airborne particles, she said. But despite some high-profile setbacks, some say the system is working. David Uhlmann is director of the environmental law and policy program at the University of Michigan and former chief of the DOJ’s Environmental Crime Section. He argues in academic papers that the DOJ tries more criminal prosecutions for environmental violations than any other area of corporate crime. Instead of honing in on major corporate prosecutions, Uhlmann wrote in a 2011 paper, the federal government should be enhancing its enforcement of the thousands of unchecked violations. “A more robust regulatory scheme with appropriate criminal and civil enforcement for violations may do more to deter risky behavior than a record-breaking criminal prosecution,” Uhlmann, a former chief of the DOJ’s Environmental Crimes Section, wrote. But others who study environmental criminology — a small but growing niche of criminal justice research — disagree. Jarrell argues that the solution is a separate set of courts for environmental crime cases. Graham Kates is deputy managing editor of The Crime Report. This project was partially funded through a grant from The Fund for Investigative Journalism. Kates can be found on Twitter, @GrahamKates. He welcomes comments from readers. For most of Amy Adams' tenure as a regional director with the North Carolina Department of Environment and Natural Resources (NCDENR), she believed she was working for a standout law enforcement agency. “If you had asked me five years ago, I'd have told you North Carolina was the leader in the (southeast) region,” Adams said during a recent interview with The Crime Report.